Here are some screen shots from the Tori & Alanis Best Buy Commercial for the 5 1/2 Weeks Tour. You can read more about the commercial below the photos, and read a complete transcript of what Tori and Alanis say courtesy of Kris Kelly. The commercial has been seen so far on MTV, VH1, and ESPN. ANNOUNCER: See what happens when Best Buy and mp3.com connect you with Alanis Morrisette and Tori Amos! 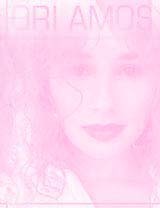 Q: You're going on tour with Tori Amos. Looking forward to that? Have the two of you met before? Alanis: I finally got to know Tori yesterday. We spent the whole day together filming a commercial for Best Buy. It's not like any commercial you're used to seeing. We had a great time. We just sat there and interviewed each other. I asked her questions about God and capital punishment and whether it was skirts or slacks for the next millennium. I think it's skirts. We've come full circle. Tell everyone to keep an eye out for the commercial that Tori and Alanis shot...it aired for what I think is the first time tonight on VH1. Basically it consists of Tori and Alanis talking to each other on couches opposite each other in a blue room...many rapid fire close ups alternating between the two. The conversation is actually edited into very quick soundbites, so it may take a few viewings to catch exactly what they say (I did hear Alanis mention "the snakes in the video") It's a very cool, engaging commercial.